Another trip along the coast. This time, I stopped in Dickinson, Texas to visit a friend from nursing school. She has a lovely bit of the swamp that fools the senses into believing one is well away from the throngs of civilization. Nestled along the banks of a gully, the house is shielded from the surrounding neighborhood by rampant dense growth of new and old forest. As pleasant as hanging out there was, I had to get on down the road home to feed my clowder of cats. By chance, and my innate GPS, I found State Highway 3 and headed South toward Galveston. The road took me through Texas City, to League City. Along the way, I enjoyed the light traffic and out-in-the-country feel of the area I passed through. Neighborhoods occasionally bordered the highway, and light industrial businesses popped up just off the road in places. Flowers bloomed all along the way even in those areas disturbed by the presence of humans. The terrain grew lower and swampier just as I came upon I45 into Galveston. A short drive later, and I was crossing the sparkling waters of Galveston Bay under a flawless blue dome of sky. I marveled at the feeling I have when at abject sea level. I love the feeling of being at the point where the earth goes from aqueous to gasseous. 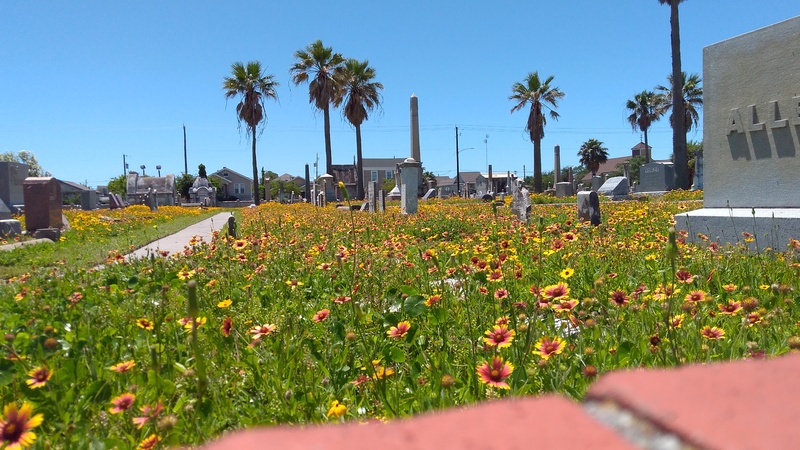 A touch down on Broadway, and I cruised until I came the Old Cemetery. 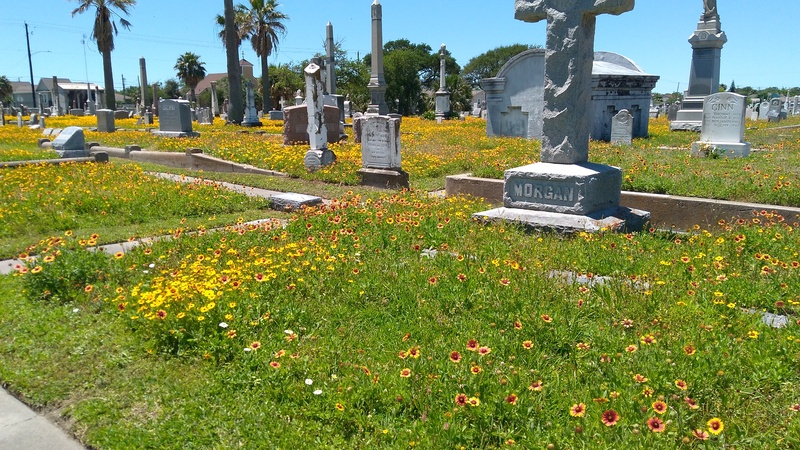 At this time of the year, it is awash in wildflowers. I had to stop. I pulled into the cemetery on the street that runs through it and parked. Thanks to the camera in my phone, I got photos. 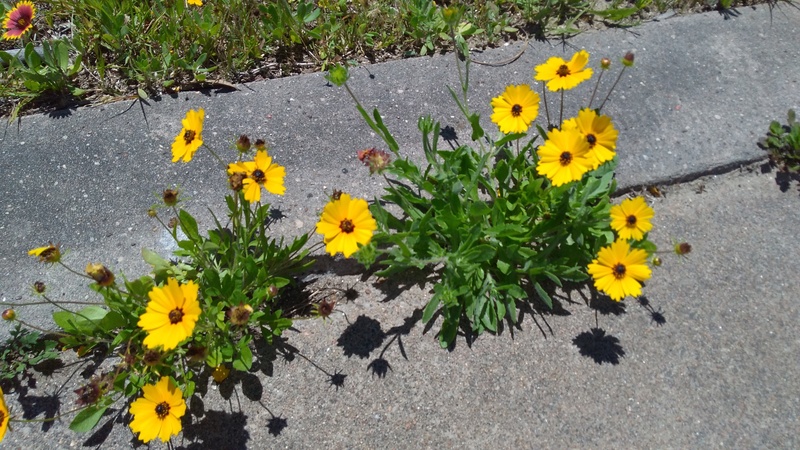 In person, the brilliant yellow flowers almost overwhelm the eye. 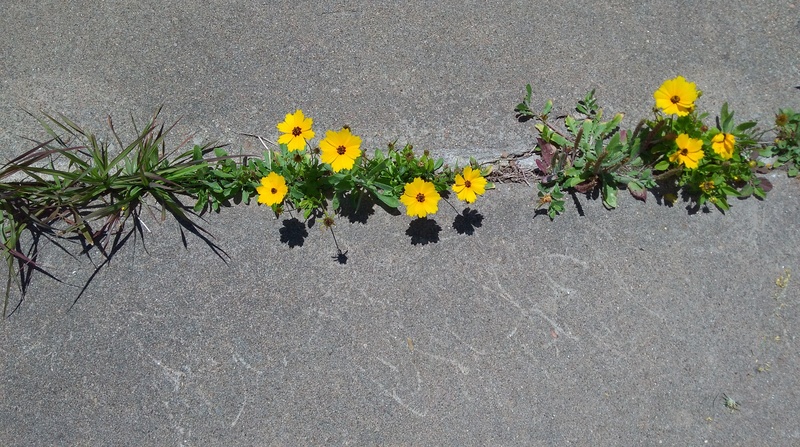 I took close ups of some growing in seams of the sidewalk.. I got back on the road and drove straight onto the ferry. As luck would have it, It was the Robert C. Lanier again. I tried to get a photo of the name, but I was blinded by the sunlight and had to guess what was on my screen. 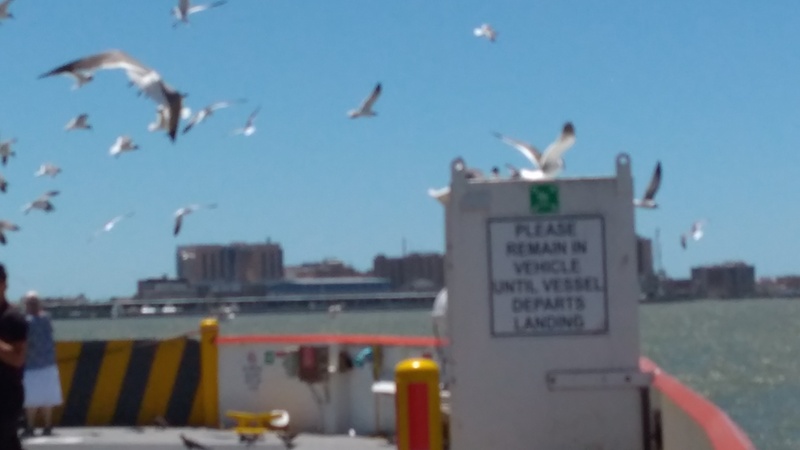 I did get a nice shot of a pigeon and a grackle riding across from island to peninsula as well a bit blurry shot of the seagulls following the stern. 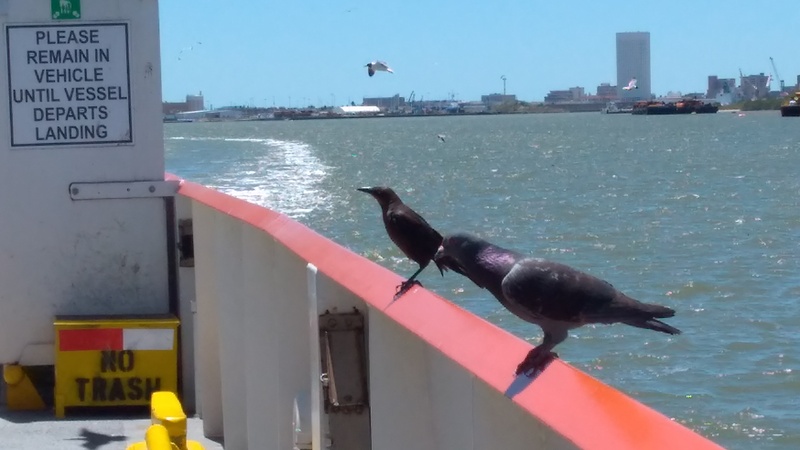 With Galveston in the rear view mirror, I cruised up Bolivar and once again saw a flock of roseate spoonbills working a tidal ditch. Their bright pink bodies above the water on their long legs resembled tropical flowers as they filtered the mud for crustaceans. No time to stop for photos. I felt the pull of home and my cats, so I followed the road until it led into my driveway. Happy cats greeted me, eager for a pet and a cuddle. 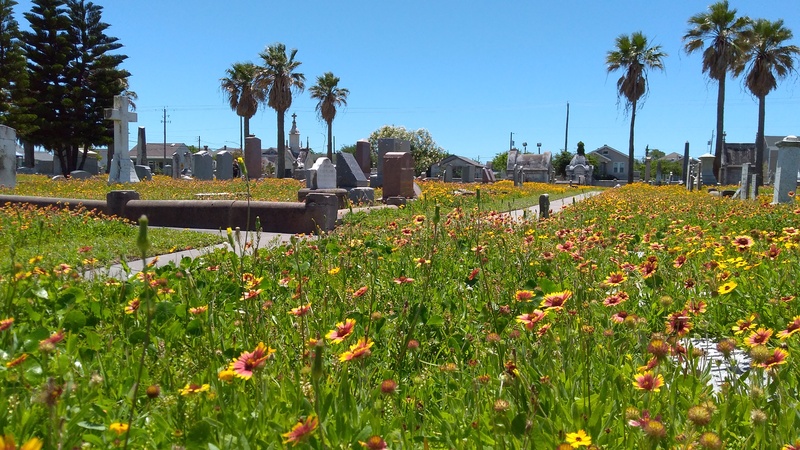 This entry was tagged # MRJones, Galveston, Texas coastal travel. Bookmark the permalink.